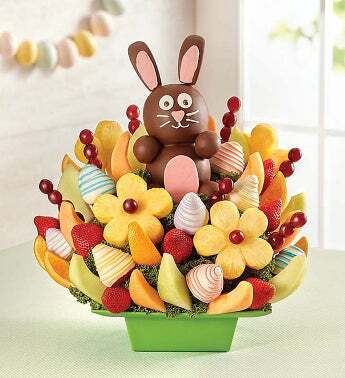 Family and friends will be hopping by to share our sweet Easter fruit creation! As adorable as it is delicious, our bunny is made of chocolaty dipped apples decorated with a sweet bunny face. It’s surrounded by a mouthwatering arrangement of daisy-shaped pineapples, dipped and plain strawberries, melon and more. Pair it with a festive balloon and you’ve got the perfect gift to please everyone at the holiday table.